The current flag and crest was approved by the Board in 2013. This is the first crest of the Foundation since its establishment in 1997 and is a natural continuation of the traditions and character of this international organization towards its mission as a natural extension of activities and the work of Princess Diana. The flag and crest of the International Foundation "Lady Diana" are determined by a decision in accordance with which they are symbols expressing the international status of the organization relevant to freedom, equality and humanism as a basic foundation in the development and the views of the Foundation and all its representatives members and volunteers. The flag of the "Lady Diana" has a rectangular shape and consists of two colors: white and purple vertically from left to right as colored fields are identical in shape and size, but between them is a large emblem of the foundation which is an integral part of the flag representing precisely Foundation "Lady Diana". Art. 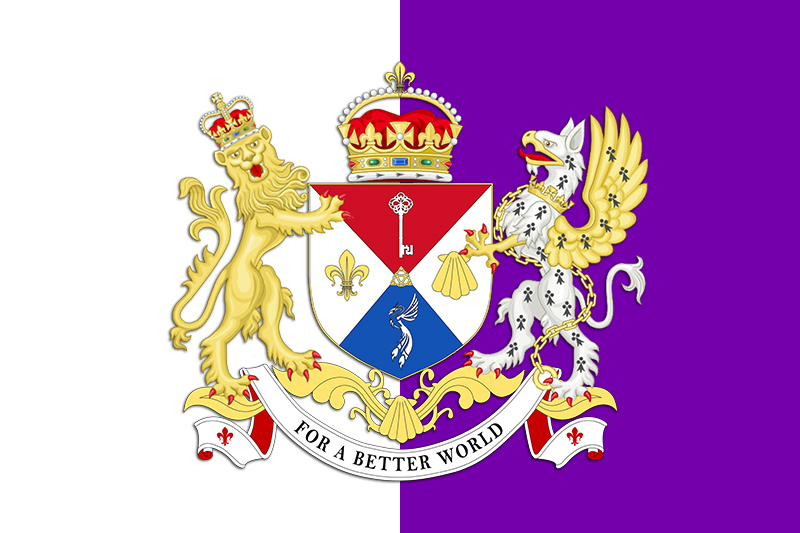 2 The flag of Foundation "Lady Diana" is a two-color: white and purple placed in equal parts from left to right vertical, and between them is a large emblem of the Foundation in equal parts on each half of the two color fields as crown royal lily over shield serves as a reference center from which the left side, a golden lion and part of the shield is the white half and half his right white griffin and the other part of the shield are located on the purple half of the flag. Shape and size: a rectangular sheet with two equally sized vertical colors: white (on the chassis) and Purple. - The ratio width to length is 2: 3. - Depending on the size of the flag emblem must be in proportion to the size of the flag (calculate) vertical version of the flag of the "Lady Diana"
White - symbolizes peace, neutrality, prosperity, spirituality, perfection, harmony and purification. Purple - symbolizes power, nobility, independence, generosity, magnanimity, wisdom and dignity. Bearer: International Foundation "Lady Diana"
Motto: "FOR A BETTER WORLD"
Shield - divided into four equal parts with three basic colors (red white and blue). Shell - Protection, compassion and mercy. Phoenix - resurrection, immortality, hope and symbol of higher virtue and grace, strength and prosperity. Shieldbearers - represent the lion and griffin on both sides of the shield that it "supported"
Golden Lion with Crown - symbolizes wisdom, pride, patience and nobility. Pedestal Golden ornament with acorn in the middle on which the shieldbearers stand also has pedestal hanging bar motto, and at both ends of the ribbon are depicted royal lilies. The Motto is an integral part of the emblem, and is written in English.